Buona sera. The exceptionally loud minority of vociferous children seems to be shrinking. Atheists have never been popular, and are the least-liked group in America (and probably most of the world). "Why don't people like atheists, Uncle Bob?" This is not the kind of atheist that is a "live and let live" type, you believe, I don't, so what? No, so-called "New Atheism" is shrill, irrational, obnoxious, vituperative — it becomes a caricature of itself. People want meaning in their lives, and are not satisfied with a religion that is based on bad thinking, emotionalism and hate. The obstreperous atheist handbook says that if you cannot defeat your opponent through reason (which is the usual outcome for these kids), resort to finding any and every excuse to mock and ridicule said opponent. It does not solve the problem, but attempting to tear others down somehow makes atheopaths feel better about themselves, capice? So, be careful how your spend your time, and with whom. One indicator of the slow death of modern atheism is that failing (it's not dead yet, but it was coughing up blood last night) is Internet market share. Has internet atheism shown a big decline in market share? 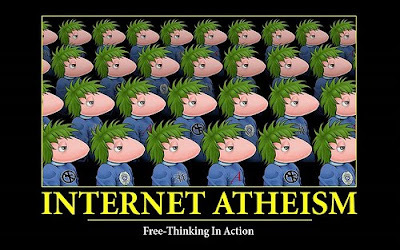 Is internet atheism losing to Christianity? 1. Has the market share of leading atheist websites plunged in the last 5 years and in 2012? 2. Is global atheism/agnosticism declining and expected to decline in an accelerated fashion? Before we provide some exciting data/graphs concerning internet atheism and skepticism, we first want to give you some relevant background information. Read the rest of "Internet atheism: The thrill is gone! ", here.